Directed by Adam Bryan. 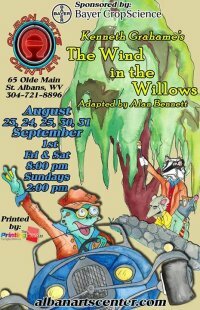 In the title roles; Daniel Calwell as Toad, John Johnson as Badger, Loren Allen as Rat and Kyle Casto as Mole. With the talents of Anna Felty, Fiona Sullivan, Angel Gandee, Mackenzie Southall, Caden Chapman, Heather Hicks, Emma Leary, Lauren Casto, Ashley Miller, Emma Robinson, Ila Ilavezhil, Ashley McCann, Faith Bromlett, Asa Lyvers, Miriam Hill, Jaxzen Allen, Meredith Shuff, Ivy Caplinger, Nikki Williams, Olivia Mccoy, Ostin Williams, Faith Medley, Anna Shuff, BB Clark, Jillian Southall, Aria Cowder, Bri Murphy, Rubin Shirley, Izzy Hewitt, Bohdi Allen, Elijah Kiser, Logan Roberts, Kaylee Anderson, Wyatt Hanna, Hailey Lambert, Linda O’Neill, Marlette Carter, Jessica Smith, Tabatha Slater and Libby Londeree. Throwing off spring cleaning, little Mole escapes from his hole and meets the dapper and easygoing Rat along the Riverbank one fine day. They soon hit it off becoming friends, and meet many of the animals going about their business on the riverbank, including rabbits and hedgehogs and otters, but the most notorious of all is Mr. Toad of Toad Hall. Mr. Toad is a most impulsive and rich toad who cannot help himself indulging the latest fad whether it be boating or caravanning. Invited by Toad to go in a gypsy wagon, Rat and Mole witness the birth of Toad’s latest craze when a new motor car runs the wagon off the road and Toad’s immediate obsession with the horn-tooting fast cars leads him to buy, and wreck, many new automobiles. Mole, feeling adventurous one day, takes a stroll through the Wild Wood, adjoining the Riverbank and is confronted and beaten by the nefarious weasels and ferrets. Rescued by Rat, they take refuge in the home of the gruff and grumbling Badger. Meanwhile, Toad, who has wrecked yet another motor car, is confronted by Badger, Rat and Mole and is locked up in Toad Hall until he can give up his wasteful ways. Toad escapes their vigilance and STEALS another car, ultimately driving it into a pond. Arrested and infuriated with Toad’s nonsense, the Judge sentences Toad to 20 years in prison, until a guard’s daughter helps him to escape dressed as a washerwoman. Badger, Rat and Mole have been keeping an eye on Toad Hall, which has been overrun by the weasels, stoats and ferrets and meet Toad, who has had many adventures disguised as a washerwoman, when he tries to return home. They hatch and execute a daring plan to drive the Wild Wood weasels from Toad Hall, using a secret passage that only Badger knows about, catching and thrashing the weasels they save Toad Hall, and Toad is acquitted. The friends celebrate, and Toad has, hopefully, learned his lesson. Approximate run time 1 hour 45 min.